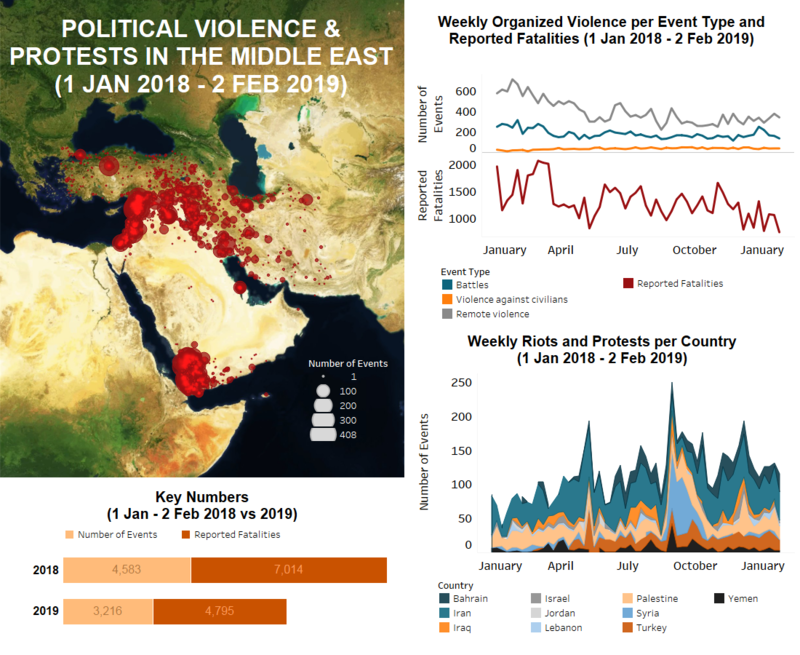 Throughout the Middle East region last week, instances of battles, remote violence, and demonstrations have all decreased. As a result, reported fatalities have dropped significantly since the previous week. This drop can mostly be attributed to Syria, where the high casualty operation against the Islamic State (IS) in Deir-ez-Zor governorate is seemingly coming to a close. In Palestine, the West Bank remained the centre of conflict activity last week as violence continued between settlers, Israeli security forces, and Palestinian locals. One fatality was reported in the region when a Palestinian woman who had allegedly carried out a stabbing attempt was shot dead by Israeli forces at the Az Zaayyim checkpoint. Meanwhile, the Palestinian Authority (PA) has ordered a freeze on the implementation of a controversial Social Security Law, which had been the subject of protest demonstrations and strikes throughout several cities in the West Bank. Opposition to the law revolved primarily around a mistrust of PA bureaucrats, especially with regard to managing money (Times of Israel, 29 January 2019). In Gaza, around 10,000 Palestinians demonstrated along the border as part of the weekly Great March of Return agitation. No deaths were reported, although there were several injuries as a result of clashes between rioters and Israeli forces. Clashes and injuries were also reported during the weekly maritime demonstration off the coast of North Gaza last Tuesday. In Israel, thousands gathered to demonstrate against police brutality in Rabi Square, Tel Aviv city, after a mentally ill Ethiopian-Israeli was shot dead earlier in the month. Near the end, demonstrators clashed with police and nine demonstrators were arrested. Demonstrators claim that Ethiopian Jews, among other groups, are often the targets of police violence (Haaretz, 31 January 2019). In Jordan, two demonstrations took place in Amman last week. Among them was a continuation of the ongoing Fourth Circle agitation which is calling for significant changes to economic policies and the tackling of state corruption. On the same day, private school bus drivers demonstrated outside the Ministry of Transport against recent reforms. In Lebanon, the formation of a new government was finally announced after approximately eight months of delay. Recent demonstrations against the state had been ongoing throughout the country, in large part due to its inability to organize and tackle the nation’s economic issues. The existence of many rival factions within the government led to deadlock following the May 2018 parliamentary elections over the makeup of the cabinet (Middle East Eye, 31 January 2019). In the north, there were two incidents which occurred in Palestinian and Syrian refugee camps – Baddawi and al Ghazaliah, respectively. In the former, armed clashes broke out between Palestinian security forces and unidentified wanted men. In the latter, an unidentified group fired on Syrian refugees from the back of a pickup truck, reportedly causing serious injuries to six people. In Iran, peaceful protests continued across the country, albeit to a lesser degree than the previous week. The majority of demonstrations were held by labour groups from different industries to demand their unpaid wages, although farmers, students, and teachers also demonstrated in various localities. In Bahrain, there was a spike in riots and protests last week. Among them were agitations against the Supreme Court’s upholding of lifetime prison sentences for Sheikh Ali Salman, the Secretary General of Bahrain’s main political opposition group Al Wefaq, and two other leaders for allegedly spying for Qatar (Al Jazeera, 29 January 2019). The case against Salman is based on recorded telephone conversations he had with the then-Qatari Prime Minister and Minister of Foreign Affairs in 2011. He had been previously arrested and charged on several occasions for his critical views of the Al Khalifa regime (Amnesty International, 28 January 2019). Furthermore, additional demonstrations followed the arrest of prominent Shiite cleric Sayed Majeed Al Mashaal, head of Islamic Ulama Council, only three days after he was released from prison. Al Mashaal had served a two-and-a-half-year prison sentence for organizing a sit-in outside the home of Ayatollah Sheikh Isa Qassim in Diraz following the revocation of the latter’s citizenship in 2016. He was re-arrested pending investigation over the charge of inciting hatred against the regime (Bahrain Mirror, 3 February 2019). In Turkey, there was an attack by unidentified men armed with metal rods on a Republican People’s Party (CHP) branch in the Eyup district of Istanbul. At least three people, including the head of the branch, were injured. The attack was reportedly motivated by tensions in the upcoming local elections (Beyaz Gazette, 29 January 2019). Meanwhile, clashes continued between the Kurdistan Workers’ Party (PKK) and Turkish security forces in the southeast. In one incident, Turkish forces intercepted two PKK makeshift drones loaded with explosives near the Sehit Ercumen Turkmen military base and Gendarmerie headquarters in the Silopi district of Sirnak. No casualties or damage were reported as a result. Turkey claimed that the drones were sent from PKK bases in northern Iraq (Karar, 30 January 2019). In Iraq proper, Turkish forces engaged in clashes and airstrikes against PKK fighters in the districts of Amedi and Soran, Dahuk and Erbil governorates. Elsewhere in Iraq, Islamic State (IS) militants continued to target Iraqi police with sniper attacks in Diyala governorate. IED attacks decreased in number, although there were several instances reported in mostly Sala al Din and Anbar. Six people, including police and civilians, were reportedly killed when two suspected IS bombs targeted a police vehicle south of Al Shirqat city. At the same time, several IS attacks on mukhtars – local community leaders – occurred throughout the country, in which two were reportedly killed and one was freed from IS captivity during a military operation. In Yemen, a bomb of unknown origin caused a large explosion in the western coastal city of Al Mukha, reportedly killing seven civilians and injuring more than 20 others. Among the dead were a number of Yemeni restaurant workers, Somali refugees, and a journalist for a UAE TV channel. Meanwhile, clashes continued across all the major frontlines, with anti-Houthi forces claiming to have gained territory in the northern districts of Baqim, Kitaf, and Khab wa Ashaf in Sadah governorate, amid high fatalities. De-mining teams from both pro-Houthi and anti-Houthi groups removed landmines in Hodeidah city in preparation for the United Nations (UN) observer team (for more on landmines in Yemen, see this recent ACLED piece). Both sides accused the other of firing on the de-mining squads, with at least one fatality being reported. Likewise, anti-Houthi groups accused Houthi forces of firing on UN personnel. Further north in Hajjah governorate, local Hujar tribesman of Kushar district engaged in clashes with Houthi forces throughout the week, managing to hold them off with the help of Saudi-led coalition airstrikes. In the southeast, clashes were fought between security forces and Al Qaeda in the Arabian Peninsula (AQAP) militants in Shibam city of Hadhramawt governorate after a bomb was discovered along with Al Qaeda flags. In Syria, regime forces and rebel factions continued to clash and exchange shelling within and along the DMZ in the governorates of Idleb, Aleppo, and Hama. In the western countrysides of the latter two, Hayat Tahrir al Sham (HTS) militants engaged in artillery and small arms fire. Sporadic clashes between pro-regime/Russian militias and pro-Iranian militias were also reported in the Hama countryside. In Deir-ez-Zor governorate, clashes between Syrian Democratic Forces (QSD) – supported by Global Coalition airstrikes – and IS fighters continued in the last few villages under IS control along the eastern bank of the Euphrates river. There are reports of ongoing negotiations between QSD and IS representatives to reach an agreement which might allow IS fighters to withdraw from their remaining territories. However, so far, there has been no agreement (SOHR, 31 January 2019). Finally, leaders from Turkey, Russia, and Iran are scheduled for another round of talks in Sochi on 14 February to discuss the overall situation in Syria, with a specific focus on the DMZ around greater Idleb (Armedia, 4 February 2019).